The festive season is around the corner and moms, dads, aunts and uncles, not to mention grandparents, will be looking at magazines and websites to find the top toys for tots and preschoolers. While tweens and teens will be writing, emailing and ‘yik yakkking‘ their own gift requests to poor old Santa. When I look around my kids’ playroom all I see is a wasteland of toys. One of my daughter’s most expensive gifts from Christmas 2015 was a rather hi-tech doll. To be fair, she hadn’t asked for it, but I was impressed with everything it could do and so I bought it as her ‘surprise’ gift. It cost over $200 and I have had zero return on investment. That doll has maybe been played with once. My philosophy is that anything difficult in life must have a lesson attached, otherwise, what’s the point? I have learnt two very important things while being a parent – the best toys for tots do not have to cost an arm and a leg nor do they need to entertain us, the adult. Fisher-Price’s Mega Bloks First Builders Big Building Bag still features on all the top toys for tots reviews and best seller lists and it’s easy to see why. With 80 classic-colored building blocks, including special shapes, there’s no limit to what your little one can create. Perfect for little hands, Mega Bloks is a mega-good idea for your toddler. Books aren’t traditionally considered toys for tots but I think it’s worth including First 100 Words by Roger Priddy, It’s a geat addition to a nursery and it’s afforable. The book includes 100 color pictures and 100 simple first words to read and learn. The award-winning Moluk Bilibo is a deceptively simple designed toy, which is what makes it so awesome. The iconic shell shape arouses curiosity, engages the imagination and encourages creativity. Whether it’s rocking, hiding, sliding or spinning, Bilibo provides endless hours of fun, for boys and girls, indoors and out, at the park, at the beach and in the snow. 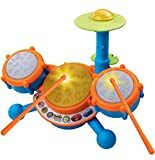 The VTech KidiBeats Kids Drum Set comes with a pair of drumsticks that can be used to tap the electronic learning drums. Whether it’s freestyle or playing along to the nine pre-set melodies, your child will feel like a real rockstar. 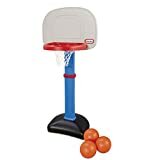 Another favorite on my toys for tots list, the Basket Ball set from Little Tikes gets kiddies active while teaching essential skills. The height of the hoop can be adjusted to six settings, between two and four feet, accommodating the tiniest of players and the oversize rim and kid-size basketball ensures easy scoring. Finally, you can encourage your tots to monkey around with this rather cute little fella from Alex Toys. 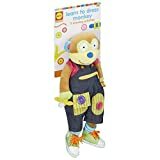 The award-winning plush toy monkey features 11 dressing activities including snap on straps, buttons, hook and loop, zipper plus a whole lot more. He teaches children to dress themselves, in a fun way, from head to toe and he’s a cute companion too. VTech Go! Go! Smart Wheels Ultimate RC Speedway was named TTPM Most Wanted toy for the 2015 holidays. The play set features more than 13 feet of interchangeable track and a chunky car that toddlers and preschoolers can easily control with a two-button, steering wheel-shaped remote. I’ve had to child-proof all my razors because the little guy in our house is always trying to be ‘just like dad’ and get rid of his ‘mouse-tache’. The Rub a Dub Shaving Kit in the Tub set from Alex Toys includes one play razor, 7-ounce foaming body soap, comb, shaving brush and an unbreakable child-safe mirror. I love this educational cupcake set from Learning Resources almost as much as I love real cupcakes. The set includes 8 two-part cupcakes which pull apart to reveal a circle, square, triangle, rectangle, oval, hexagon, star and heart. Match the shapes to put them back together then match the shape to the pan bottom. Loads of delicious fun for all! Strange how they love doing chores when they’re too little and yet, when they grow up and can manage them, suddenly the enthusiasm has waned. The Little Tikes Gas ‘n Go Mower includes a clicking key and moveable throttle as well as a removable gas can they can ‘fill’. The Laugh & Learn Smart Stages Piggy Bank from Fisher-Price introduces baby to counting, colors, language and more through music, silly sounds and phrases. With 10 colorful coins to drop into the Piggy Bank’s back, and a door for put-and-take play, it’s a toy with lots of exploration. Featuring Fisher-Price’s Smart Stages Technology, the piggy bank will ‘grow’ with baby at their pace. I love this ‘pretend’ gardening table for growing kids’ imaginations. With two pots, two flowers, and two soil disks for planting. It includes real watering can and table basin with plug, as well as a rake, shovel and sifter tray. The EIGHTBIT Swivel Ride on Car relies on gravity and friction created by the rider. It’s strong enough to handle the most enthusiastic adults and safe enough for adventurous toddlers. A definite favorite on my toys for tots list, the wheels won’t scratch or dent your floors, making it inside-friendly. The 37-piece Discovery Space Center provides endless fuel for imaginative explorations into any galaxy. The highly detailed, four-level spaceship is designed like actual space shuttles with areas for mission control, an onboard laboratory, a living compartment and even an exercise room all connected by a working elevator for children to utilise as they launch into the great universe. Some toys for tots don’t take into consideration that children develop at their own pace, but the good people at Fisher-Price have with the Smart Chair and Smart Stages Technology. There are various levels available, each one suited to your child’s development, at his or her own pace. Activities like turning the book pages, pressing the remote control buttons or lifting the seat cushion introduce the concept of cause and effect. The Battat Take-A-Part Airplane allows curious little minds to discover how pieces work together to make a larger whole. This set includes 21 parts and a power screwdriver with three interchangeable bits. Parts and fasteners are oversized, made for small hands to manipulate. The cute shingled roof treehouse from Step 2 allows little ones to climb, slide and spy in this elevated playhouse. It’s sturdy and can hold up to 50 lbs. Your little one will love cruising along on this Harley-Davidson styled trike. Cool features like a ‘clicking’ key and the secret storage compartment under the comfort-ride seat add to the fun! And the wide, stable wheel base, easy-grip handlebars and big foot pedals help even the littlest riders get rolling. I’m not big on ‘pink’ and ‘blue’ toys for tots and have always encouraged my two to play with whatever they want. But every little girl (or boy) wants to be like mom with their very own purse. What I like about My First Purse is it includes just enough pieces to be engaging without being overwhelming. You can’t go wrong with the Sit-to-Stand Learning Walker by VTech. It helps your baby develop from a crawler to a walker through adaptive technology. Your little one will have endless fun as they learn to walk and learn colors, shapes, animals, music and a whole lot more. As far as fabulous toys for tots go, the Nuby’s BPA Free Octopus Floating Bath Toy is a fun and interactive way to make bath time more enjoyable. It comes with one floating octopus and three rings to toss on the octopus’ tentacles. The octopus and his friends provide endless fun in the bath or pool. Best For: hand-eye coordination, motor skills, stimulates baby’s senses. Babies love the fun and repetition of Baby’s First Blocks from Fisher-Price. While they put all the blocks into the bucket, one by one, and then dump them all over the place, again and again, they’re having fun and learning colors, shapes and language. 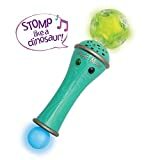 Made from soft, durable foam and great for indoor and outdoor play the Kidoozie foam pogo jumper squeaks with every hop! The bungee stretches to accommodate children of all sizes and heights and can support up to 250 pounds. What toys for tots are your kids loving? Let us know your favorites in the comments below! Feature image adapted from image courtesy of Flickr, Marcin Moga. Melinda Connor is a qualified teacher, a Montessori ambassador and a mom of two. Once upon a time all she wanted was world peace but now a little alone time in the 'l'eau' will do just fine.